Fluoroelastomers are ﬂuorine-containing polymers noted for their exceptional resistance to heat, weathering, and a wide assortment of ﬂuids and chemicals, as well as for their exceptional sealing and mechanical properties. The working temperature range for ﬂuoroelastomers is considered to be -26°C to 205–230°C, but for short working periods they will take even higher temperatures. Some perﬂuorocarbon elastomer types can resist temperatures up to 327°C. Components fabricated from ﬂuoroelastomers, for example, certain O-rings, gaskets, and hoses, are essential for industries such as automotive, aerospace, and others, usually providing reliable, leak-free function. Fluoroelastomers are used mainly in seals and barrier layers subjected to environments too severe for other elastomers. The global market for fluoroelastomers has been driven largely by the rapid development of the Chinese automotive industry in the past decade, as well as the recovery from the economic crisis in late 2008 and the entirety of 2009, which hit the automotive industry in the United States, Europe, and Japan particularly hard. Based on volume (base raw material), the United States and China account for 30% of world consumption each, Europe for 20%, and Japan for 10% in 2016. 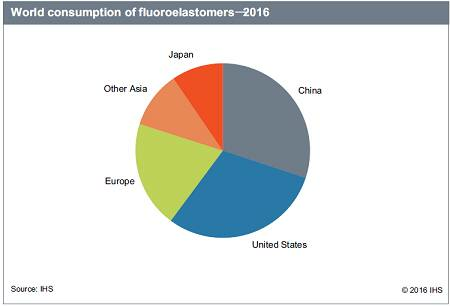 These four regions represent nearly 90% of the world consumption of fluoroelastomers in 2016. Fluorocarbon elastomers are noted for their exceptional resistance to heat, weathering, and a wide variety of fluids and chemicals, as well as for their excellent sealing and mechanical properties. They are used in highly demanding applications where extreme temperature ranges and chemical attack are encountered. The chief limitations on the use of fluorocarbon elastomers are cost and the relatively different technology of compounding and curing, which may involve long postcure times. The cured products generally have fairly good low-temperature flexibility and low resilience. Solvent resistance is generally high; however, certain organic liquids can cause considerable swelling. In addition, fluorocarbon elastomers are very sensitive to moisture and processing them is difficult because it requires a strictly controlled environment. Thus, it is costly to compound these polymers. Fluorosilicone elastomers are also known as ﬂuorovinylmethyl silicone rubber. Fluorosilicones are inherently UV and ozone resistant and have a combination of ﬂuorocarbon and silicone characteristics. They resist solvents, fuels, and oil similarly to ﬂuorocarbons and have high- and low-temperature stability (usable up to 177°C and at temperatures as low as -73°C) similar to silicones. The primary disadvantage is their lack of toughness and abrasion resistance, giving them limited usefulness in dynamic sealing applications. Fluorosilicones are widely used for static applications in aerospace fuel systems and in automotive fuel emission controls, where the fluids of fuels, coolants, and oils would cause most other products to deteriorate. Perfluoroelastomers are a specialty high-performance elastomer with exceptional chemical resistance properties and high-temperature stability. Perfluoroelastomers are resistant to more than 1,800 chemical substances (including ethers, ketones, esters, aromatic and chlorinated solvents, oxidizers, oils, fuels, acids, and alkali) and are capable of handling service temperatures up to 327°C. The primary areas of application (mainly in high-performance O-rings/seals) are in paint and coating operations, oil and gas recovery, semiconductor manufacture, and in the pharmaceutical, chemical process, and aircraft and aerospace industries. Perfluoroelastomers can be used for all applications where the properties of regular fluorocarbon elastomers are not sufficient. Their most important feature is their extreme reliability. Total consumption of the three major fluoroelastomers is forecast to grow at an average annual rate of around 3.6% through 2021. Major market drivers are new product developments in sealing applications (better performance), further tightening of emissions standards in many of the industrialized countries, and strong expansion and resurgence in automobile production.